Noale, 29 July 2015 – For the second time this season, Aprilia will come into the race weekend with a three-pronged attack formation. 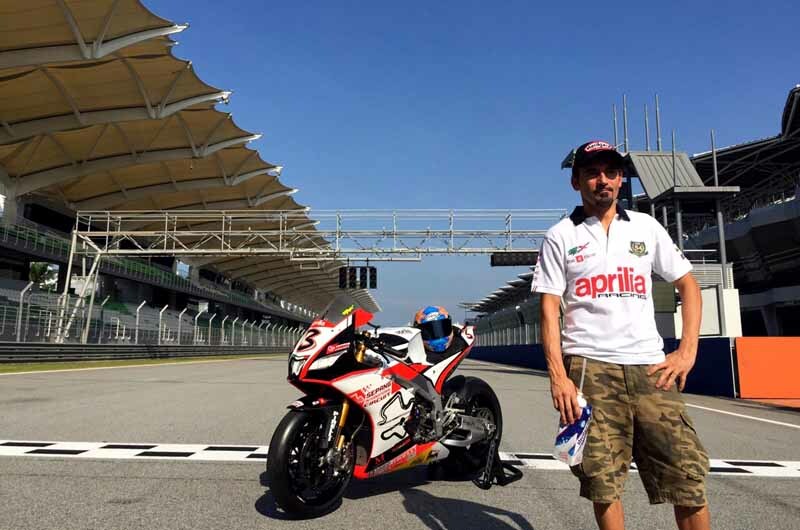 Six-time world champion Max Biaggi will be on the track with the Noale Test Team, riding his number 3 RSV4 RF alongside the “twin” bikes ridden by Leon Haslam and Jordi Torres. The Laguna Seca round held contrasting sensations for the Team Aprilia Racing – Red Devils riders. Leon Haslam wants to take advantage of the Malaysian track’s characteristics to get back to the positions he deserves and he is making no bones about wanting to win. His first Superbike podium, achieved in the last round in the USA, could be the turning point in the season for rookie Jordi Torres. The objective on the horizon is clear: to prove that he is the best rookie in the category. After the extraordinary sport and press event at Misano, where Max Biaggi surprised fans and staff by dominating the Friday sessions and riding two outstanding races, on the Malaysian track the Corsair will be taking on a new challenge. It will be a decidedly demanding one, given the equatorial weather conditions combined with his less than perfect knowledge of a track where he has never raced with a Superbike. During the tests conducted last week Max and his team had to deal with rain on three of the four days available to them, collecting little information and increasing the difficulty of returning to the track.